June 1, 2017 — #61 - Season 3 finale, a celebration of Au Gres and unveiling of a new themed concept. April 21, 2017 — #60 - A conversation about the designed authenticity of creating a powerful "Culture of Learning." April 12, 2017 — #59 - A discussion about the Au Gres Area Chamber of Commerce's new communication sub-committee. March 22, 2017 — #58 - Abigail Ertel, Community Program Lead for Huron Pines, discusses the focused positive work and role(s) her organization provides to build partnerships and capacity toward proactive environmental awareness and sustainability throughout Northeast Michigan. March 8, 2017 — #57 - Dr. Kaleb Patrick, faculty member in the Department of Educational Leadership at Central Michigan University, visits the Au Gres-Sims campus to discuss student preparation for collegiate success. March 1, 2017 — #56 - Au Gres welcomes Jamie Kraatz, the new Instructional Services Director for Au Gres-Sims School District. February 8, 2017 — #54 - Reflections on the action planning of the North Bay Region of Saginaw Bay (MI) team at the 2017 Conservation Fund's "Balancing Nature and Commerce in Rural Communities and Landscapes" national conference. January 18, 2017 — #53 - Newly elected Au Gres Area Chamber of Commerce President, Allison Wiltse, discusses leadership and vision for the greater Au Gres area. January 13, 2017 — #52 - A preview discussion of the Conservation Fund's annual "Balancing Nature and Commerce in Rural Communities and Landscapes" conference in Shepherdstown, West Virginia. December 14, 2016 — #51 - Matt Grabowski, a consultant in the video games and entertainment industry based in Seattle, Washington, is featured via Google Hangouts. November 30, 2016 — #50 - Celebrating the Saginaw Chippewa Indian Tribe's positive impact of financial stewardship on the greater Au Gres area. 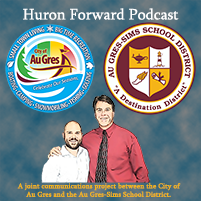 October 12, 2016 — #46 - Au Gres Community Pride, District Wide! September 28, 2016 — #45 - Welcome to Season Three of the "J & J in Au Gres" Podcast: Sharing Celebrations!